Scientist, professor, TV host, interpreter for Gorbachev, Yeltsin and Putin: Russia’s most famous polyglot Dmitri Petrov talks about political stereotypes, big markets, Tony Blair, learning Russian – and the character of horned animals. 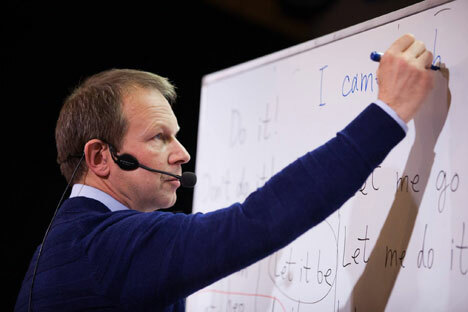 He says of his talent: “I am familiar with 50 languages; I can speak 30 to various degrees; I teach eight.” But he adds: “It’s impossible to know a language perfectly, even if you are a native speaker.” Dmitri Petrov, however, has the necessary knowledge to teach languages all over the country. The Polyglot reality show, which he hosted on the state Kultura (Culture) channel, had incredible ratings for an educational program. Teaching millions of viewers the tricks of English, German, Italian, French, Spanish and Hindi, Mr. Petrov did not peek into a dictionary and parried the cunning questions of studio participants with ease. Teaching is just one of his talents. He has been an interpreter for heads of state and is an entrepreneur, having opened his own language centre. Mr Petrov also has his own publishing house, which this year published a textbook for foreigners wishing to learn Russian. Russia Beyond the Headlines: There was no visual contact between you, but there was verbal contact. You, probably, like no one else, know the way the top officials speak, the particularities of their speech. Did you ‘tune into the wave’ of each official beforehand? Dmitri Petrov: It is not difficult to translate politicians because as a rule their statements, let alone their speeches, are well calculated and verified. There is hardly any improvisation. However, it is obviously very important to translate certain nuances correctly. Because a situation or political event can be interpreted from various angles, it is very important to translate the correct angle. For example, when Gorbachev spoke about the collapse of the Soviet Union he spoke about it differently than, let’s say, Yeltsin did. Gorbachev spoke with bitterness, describing the dissolution of the union as a lost opportunity to preserve a big country. He used words that in English would be translated as “disintegration” or “collapse”, while his opponents spoke of a peaceful separation. It was vital not to put the word “collapse” into Yeltsin’s speech, and vice versa, because the emotional aspect would have changed. RBTH: How do interpreters prepare for these meetings? Did you, for example, reread the history of Gorbachev’s presidency on the eve of interpreting for him? D.P. : I teach interpreting at the university and I always tell my students that it’s not enough to know and understand the language. It is also very important to have general knowledge, to know about world events. Because three-quarters of the translation’s correctness comes from knowledge of political events happening in the world. This helps avoid imprecision. Is Russian as difficult to learn as they say? Familiarity with political realities, as I understand, is only the tip of the iceberg. If Putin, for example, uses an obscure term or a Russian proverb, knowing politics won’t help. Have you ever been in such situations? If you remember, there was an episode in Switzerland, a conference in which Putin spoke. He was asked a question about Islamist groups and Russia’s relationship with Islam. But the interpreter couldn’t translate the word “circumcision”. He made a mistake and instead of circumcision said excision. There was a similar case, when someone from Putin’s entourage was speaking about terrorists and said: “They consider us goats,” (in Russian, this is kozlami). In English, as you know, the word goat does not have any offensive overtones; it just signifies an animal. While in Russian kozel (goat) is a rather offensive term. Tony Blair, who was British Prime Minister at the time and taking part in the discussion, did not understand the meaning of the phrase because it had been translated literally. RBTH: Were there any similar embarrassing moments in your professional experience? D.P. : If there had been any, I don’t think I would have been invited to collaborate with such important international organisations as the European Union and the European Commission. I always tried to translate the meaning, not the words. When you feel someone wants to praise or offend someone else, you must never repeat the words that are driven by the emotion or judgment. It’s important to convey the sense. That is the principal art of an interpreter. Is you interest in foreign languages something that you’ve inherited? If I’m not mistaken, your parents also knew several languages. First, at home we always had many books in many different languages. My grandmother, who had finished the Gymnasium in 1917, having received her education before the October Revolution, absorbed the zeitgeist of the era. It was forever preserved within her, even during the communist period. She instilled an interest in languages in me, just an interest, without the aim of learning them. It was just part of everyday life: reading fairy tales to children in the original language. She would read the Brothers Grimm in German and Charles Perrault in French. I grew up in a little town in the Moscow Region, though, where there wasn’t even a sign of a foreigner. But I felt the need to be surrounded by foreign languages. I felt that it was my natural habitat. RBTH: In the USSR, English, not to mention other languages, was not used very much. There was basically no one to speak English with and there was no one who could be heard speaking it. But everyone spoke Russian – in the Baltics, in Georgia, in Ukraine. Today everyone knows English. How is the situation with Russian in today’s world? D.P. : After the collapse of the Soviet Union, some former Soviet Republics stopped using the educational system in which Russian was a mandatory subject. But then interesting things happened. First, western companies that opened their branches and established themselves in the former Soviet republics, such as the Baltics, and also Poland, the Czech Republic and Hungary, hired local experts. Later, knowing Russian became a requirement for landing a job with the companies in many of these countries. For example, the western company that came to Lithuania was not satisfied with a local collaborator who just spoke Lithuanian. The aim of every business is to enter a big market, which means Russia, Belorussia, Ukraine, Kazakhstan, that is, countries where Russian is the predominant language. The second factor is tourism. There was the birth of mass tourism from Russian-speaking countries, and not only to eastern European countries, but also to resort countries such as Turkey, India, Thailand and so on. And today we see the urge to learn at least the fundamentals of Russian in many of these countries. Finally, there is another factor. Native Russian speakers actively started doing business and acquiring real estate in various parts of the world, including western Europe. A new market emerged, one related to bilateral economic ties, one that required the knowledge of Russian from a big number of people. And that is why in the past few years we’ve seen an increase in the number of students who wish to learn Russian not only in the countries where Russian tourists come to “bask in the sun”, but also in eastern European countries, such as Poland. Therefore, even if we exclude the simple interest in the Russian language as the language of Russia and Russian culture, we will still see that its popularity is growing. No wonder last year Russian was rated second after English among languages used on the internet. Russian in 16 Lessons for Anglophones was launched during the London Book Fair in July. Although it is not currently available in the UK, it can be purchased through the Dmitri Petrov language centre. RBTH: This year you published a textbook for foreigners wishing to learn Russian. Is this your attempt at conquering the ‘big market’? D.P. : Since I am connected to the education system, I know that there has always been a problem in assisting foreigners in their study of Russian. There are certain academic difficulties related precisely to the teaching of Russian. Since I have my own education centre, which has a publishing structure, I decided to assist those studying Russian in a print and electronic form. RBTH: What kind of a textbook is it? D.P. : We have already published Russian for Anglophones and Russian for German-speakers. We are preparing Russian for Francophones and for speakers of other languages. In April, I visited the London Book Fair and presented the textbook, explaining why it is different. It is not good to frighten students with complicated charts. I emphasise combinatorics, that is, I try from the very beginning to get students to develop the skill of combining. Create as many combinations as possible even from a small quantity of elements, that is, words. After the London Book Fair this textbook sold many copies in Moscow and we are now looking for a distributor in the UK. We will try to promote it for those who would be interested. RBTH: Why do you publish Russian for Anglophones and Russian for German-speakers separately? Why not create a common textbook for everyone who doesn’t know Russian? D.P. : I try to explain the theoretical part of Russian as clearly as possible. This must be done in accordance with each individual language. Each language – English, French, German and so on – has its own explanation of, let’s say, a Russian verb. For example, in German there is the category of gender, which can be useful for creating interesting examples for German-speakers, examples that are similar in their language. If the explanation is for the English, who don’t have a grammatical case, or a gender, then the explanation must be more precise: what is a gender and a grammatical case? Why do they exist? What function do they have in Russian? and so on. RBTH: Many people say that Russian is extremely difficult to learn. Do you agree? D.P. : It depends. Russian has declensions but there are no articles; Russian has conjugation, but there are fewer tenses than in English; Russian is based on the Cyrillic alphabet, yet the spelling is less different from the phonetic side of the language in respect to other European languages. For every minus there is a plus. RBTH: If you were to compare Russian with English, what conclusions would you make? D.P. : These are two great languages, which each have similar patterns of evolution. English has become a universal language, though at a cost: it is becoming more and more technical. The same fate awaits the Russian language. According to statistics, English is used about 90pc of the time when people socialise. But this happens mostly among non-native speakers. English can be spoken between a Spaniard and a Chinese, a Frenchman and an Arab. English has become a universal and a very pragmatic way to communicate among people of very different nationalities. But pragmatism inevitably leads to simplification, even to a certain impoverishment of forms when a language stops being the weapon of culture and becomes a weapon of business. This is what is happening to English, unfortunately or not. We are seeing a similar process, though to a lesser degree, in the Russian language. It is important to understand that Russian, just like English, is not a property of the nation. In the modern world, Russian is not an attribute of the Russian Federation or of ethnic Russians. As with the mobile phone system, which is valued for the quality of the signal and the quantity of callers, language is an instrument of communication that helps us communicate with millions. We have stopped perceiving language as cultural heritage, as a way to read Dostoevsky in the original or watch a Russian-language film. For most of us who study the language, it is a way to obtain an edge on the labour market or get access to information resources. Whether this is good or not, it is so. RBTH: If Barack Obama or David Cameron asked you to teach them Russian, what would you say to them? D.P. : I would support their initiative, since even the basic knowledge of a foreign language helps us understand the mindset of the natives who use it. And this is extremely important for politicians. I can remind them of Ronald Reagan, who always had a book of Russian proverbs on his desk.